An infra-red illuminated night photograph – a wolverine eats three oystercatcher eggs on a beach in Harriman Inlet. A still from a video. View the complete video. An assortment of wolverine images taken by remote, motion triggered trail cameras. Researchers place cameras near live traps to help them improve trapping techniques and to document animals that approach the trap but don’t trigger it. 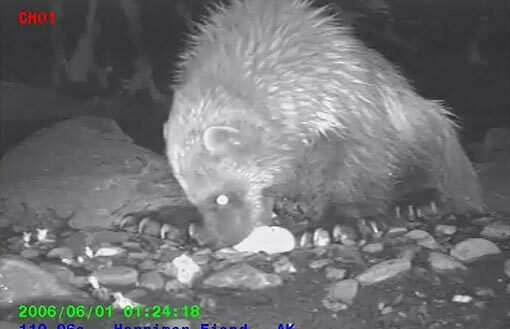 The images of a wolverine eating oystercatcher eggs are taken from a short video produced by oystercatcher researchers with USFS and Oregon State University. An assortment of wolverine images taken by remote, motion triggered trail cameras. Robin Overall of Kodiak shared nine pictures of mountain goats, all but one taken in the spring of 2014. Olivia Fletcher of Juneau began a science fair project looking at red squirrel habitat use and preferences. To her surprise, she captured numerous images of wolves. Robin Overall of Kodiak places her trail cameras on established bear trails, in view of rub trees, and near streams. She provided an amazing assortment of images featuring the famed Kodiak brown bears. State wildlife biologists on Prince of Wales Island in southern Southeast Alaska are using “hair traps” to learn about wolves and wolf numbers. Ten trail cameras were set up to monitor activity at the trap sites. A black bear explores a snare on Prince of Wales (POW) Island. This bear manages to trip the snare without getting caught. A trail camera catches the details. Night pictures of a marten near Sitka. These images of Sitka black-tailed deer in a patch of skunk cabbage were taken between June 20, 2010 and September 18, 2010, on Rivellagigedo Island in southern Southeast Alaska. Thanks to Joseph Piston for contributing this series. ADF&G wildlife technician Chad Rice sets a wolverine live trap north of Juneau in spring. A brown bear with bald patches on its flanks investigates. ADF&G biologists and wildlife technicians discovered a dead mountain goat north of Juneau and placed a remote trail camera near the carcass in early spring, drawing eagles and a GPS-collared wolverine. ADF&G biologists are monitoring animal activity at the site of wolverine live traps and documenting some unexpected visitors, including marten and brown bear. A wolverine live trap draws a wolverine and later a brown bear. ADF&G wildlife technician Jeff Jemison aimed a remote trail camera at the carcass of a dead moose north of Juneau in the spring of 2010 and drew in a bear that had recently emerged from hibernation. Bill Stannard posted a Moultrie Game Camera at his cabin in the Talkeetna Mountains and contributed these pictures to the trail camera gallery. Biologist Audrey Magoun uses trail cameras in her wolverine studies. Magoun published a how-to guide for researchers and documented her recent wolverine work with ADF&G near Petersburg in Southeast Alaska. ADF&G wildlife technician Jeff Jemison is working on several camera trapping projects, including Diana Raper’s project. Some images were taken on the Gustavus Forelands, others north of Juneau. Researcher Diana Raper has “camera-trapped” wolves, bears, coyotes, eagles, ravens, marten, and moose and works with ADF&G to monitor scavenging in the Gustavus Forelands-Glacier Bay ecosystem. Biologist Tania Lewis with the National Park Service and Oregon State University graduate student Diana Raper aimed a motion-triggered camera at a humpback whale carcass in Glacier Bay in spring 2010.